Scenic designer Laura Jellinek is having quite the off-Broadway season right now. 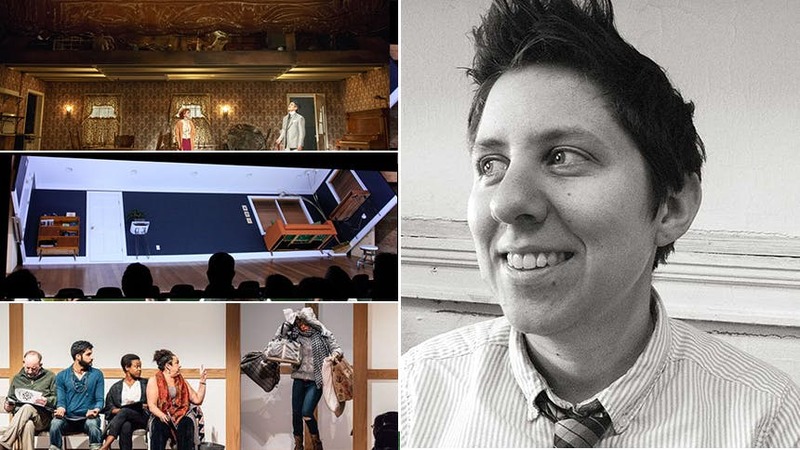 The Lortel Award nominee designed the sets for the hit 2016 plays Small Mouth Sounds, The Wolves, A Life, the current Signature show Everybody, Playwrights Horizon's The Light Years, and the upcoming show The Antipodes. The world premiere of The Light Years tells the story of Steele MacKaye and his dream to create the biggest 12,000-seat theatre in the world (the Spectatorium) during the Chicago’s World Fair of 1893. Laura Jellinek created an ever-changing, double decker set. The majority of the actions happens on the first level with changing walls, backdrops, and furniture, leaving the second level left mostly obscured until its grand, stunning reveal in the final moments. BroadwayBox spoke with Jellinek for our new interview feature with New York theatre's creators and designers. Read on as she discusses getting her start in design, building lasting working relationships in the theatre, and advice for aspiring designers. 1. What was the project that set you on a path to scenic design? How did it get on your radar as an art? I was lucky to have a great theater program in my high school where professional theatermakers from Philadelphia came out to guide us. As a result, I ended up with a pretty complete view of how theater is made and an internship at the Philadelphia Fringe Festival where I got to see a lot of interesting work. I did some set and costume design in high school, and in college I fell in with the set design teacher, Michael McGarty. I designed some student productions and got to assist Michael on some of his New York projects. It wasn't though until I lived in New York and worked in an office for a year that I realized that set design was what I wanted to do. 2. What are three things someone who is serious about a career set design should know? 1. Unfortunately, while it is possible to make a living as a theatrical set designer at the top of your field, it is quite difficult to make a living wage while you climb (most of) the career ladder. That means that the majority of people with a lot of loans, any dependents, or even a rough patch with finding work, end up needing to steer into fields like television or event design—unless they have a teaching job or some other consistent income from family or a partner. It's something that members of the field are working hard to change, but is a pretty important reality for interested people to understand. 2. While you aren't technically your own boss (since you are generally a freelance employee for a number of producing organizations at once) in a lot of ways you set the standards for your own work. Since you are always the only set designer on a project, you decide when the design is finished, how detailed to make your drawings, and how much information to give for research on a particular prop. There are deadlines, but the months leading up to those deadlines are yours to organize, and ultimately you decide how refined to make each piece of communication, from the model to research shared with the director. This can be really freeing and satisfying, but also requires a lot of great time management and self-motivation. 3. One of the questions I get most often by non-theater people is how I get jobs. Where do I apply? Where are they posted? And the answer is I don't, and they're not. The industry is very social, and the work can be pretty intimate, so it ultimately comes down to a combination of doing good work and maintaining good relationships. I am sometimes suggested by a producer, but 9 times out of 10, a director requests working with me and then the producer brings me on. This means I have a handful of directors who I've developed really strong working relationships with, which is one of the greatest parts of the job. I obviously work with new people some of the time (or those long-term relationships would never get built) but being a good collaborator, and a nice person to have around, is a huge factor in getting hired for projects. It also means that it can take a while as you get started in your career before you have consistent work, and developing strong relationships with a few directors is often the best way to make it happen. 3. How did you embark on this specific set for The Light Years? How did you come up with the concept? How much is informed by the writer(s) and director? One of the great things about The Light Years is that The Debate Society has been developing it for years, so we've had a long time to brew on the concept. I did my first round of research for it in 2011 when they were doing a writing workshop, and we've continued to expand the research file as the play has changed shape. We also were lucky to do a workshop production of it last summer at New York Stage & Film where we were able to try out a concept of how the set works. We got to learn what did and didn't work there, and were able to build on that for the design at Playwrights. Working with The Debate Society is a very specific thing, since instead of a traditional playwright/director relationship, they are really a trio that become one sort of fused being when developing the work. That means there are a lot of bodies in the room at design meetings, but also means that the set design process often informs the writing in ways that are really powerful and exciting. We always meet with all four of us at design meetings (and often other members of the design team) whereas with a traditional new play, the playwright might only come to a handful of design meetings. This collaboration with the three of them continues as we get into details like choosing furniture pieces and solving staging problems during tech. 4. What’s the most rewarding part of your job? What’s the most challenging? Getting to be involved in the very initial stages of what a production is going to be is one of the most exciting parts of the job. On a new play I am often the third person in the room after the playwright and director, and with an older play or opera I am usually the second. Having the early conversations with the director (and sometimes playwright) before we even get into discussion of the set design is really satisfying, especially as we bring in more collaborators to build on and improve our ideas. This part is also what makes some of the long-term collaborations even more rewarding, since it's not just about solving one project, but is part of an ongoing conversation about what theater we want to make and how we want to make it. The most challenging part of my job is making it work with a family. I have two small children, and besides the financial reality, there are a lot of practical challenges being a mom with a freelancer theater schedule. The long hours during tech can be very hard on my kids (not to mention my sleep debt) and there is not much precedent for being a theater designer and a mom. I'm lucky to have a few great examples (like Christine Jones) to look to, but the industry is not set up for people with kids, and it takes a lot of energy and an insane amount of organization to make it work. See Laura Jellinek's work on 'The Light Years' at off-Broadway's Playwrights Horizons through April 2.